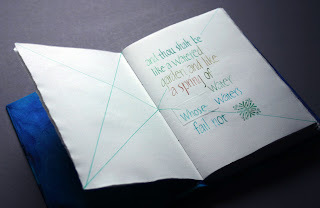 Why bookbinding on a glass blog? This is a question you might be asking. It is certainly one I asked myself before I began learning this skill and as I began posting about it. It boils down to this; I believe it is important to expose yourself to new skills and techniques. Doing so has so many benefits. Challenging and stretching one’s abilities keeps your mind nimble. Learning new skills, specific those accompanied by a new physical or social activity are commonly recommended to deter dementia. If we simply continue to do what we have always done, we use only the same neural pathways we have already developed. It would be like doing the exact same workout every time you go to the gym. Shake it up every now and then and workout a different area of your mind. A fresh perspective can generate new ideas. While working on my first book, in the summer of 2008, I learned about and used the formal canon. 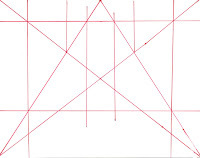 This principle uses lines drawn to divide the page indicating where text and design should be located, based on the principles from the golden mean. After preparing 128 pages this way, I became enamored not just with the technique but the lines and intersection of points it created as a design in itself. 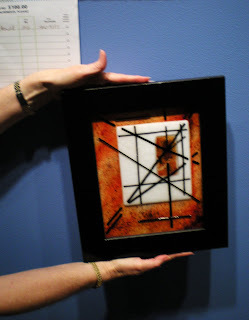 This showed up very quickly in fused glass pieces like the one auctioned on behalf of SaySi, last February. More and more I am assured of the importance of thinking through work in advance and documenting the entire process in a complete and holistic way, not just the material and firing schedule. For me, these books beginning to serve this purpose. Using the book to tell the story of a body of work from conception to completion, helps me to both plan and document a particular series. The book I created in 2008 was used as a gathering place, for thoughts on water, for a work in glass I am still slowly (very slowly) working on. In May, I made another book, which I am using to gather ideas and document the process for a series I am presently working on but I'll share more on that book/glass series later.